How to prepare this lemon rice? For more taste and richness, you can add cashews. You can also prepare this with leftover rice. 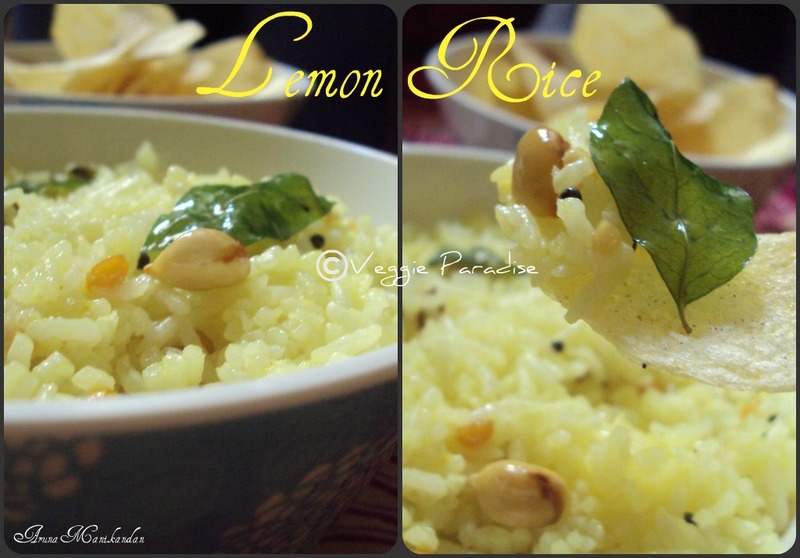 Very delicious lemon rice.. looks gr8 !! I make the same way except adding ginger.I add onions too! Will remember to add it next time. wow, I always like lemon rice. looks awesomely yummy..nice clicks ! Adding ginger sounds interesting. Will try it next time. 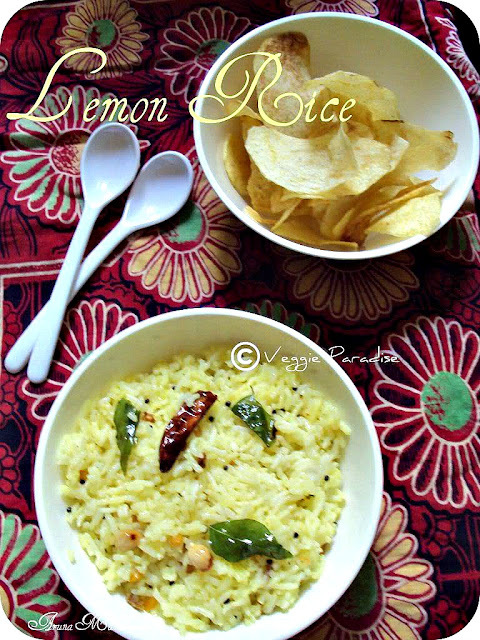 I too made it last week.. perfect with potato fry.. yumm..
My fav rice, nice adiition of ginger. looks delicious. looks delicious...one of my favourites!! Yummy ... just had lemon rice for lunch. so simple yet delicious !! My fav rice anytime,love with spicy potato roast,mouthwatering already here.. Simple and delicious, love to eat it with chips. Love the sunny yellow colour of the rice !!! Like the detailed steps to make this easy rice. one of my favourite recipes...i love to eat this..though have not mastered the art of making it...will follow your recipe and lets see how it comes out!!! My favourite...My son tells as yellow rice. My favorite rice recipe . That plate of chips makes it even more exciting. This is my fav.. such a comfort food.. urs look so soothing..
lemon rice always reminds me of picnic and travel....they look great!